This recipe is for 250 grams (about 1/2 pound) of edamame. This will make a good size appetizer for 2~3 adults. Although you can make edamame as salty or salt-free as you’d like, for a half pound of edamame, 2 tablespoons of salt is average. (1) Wash the edamame in cold water just before preparing. (2) Snip off the ends of the pods to allow the salt water to soak in better. (3) Rub with about 1/4 of the salt (1.5 teaspoons). This opens up the pods slightly, allowing the salt to soak in and the taste to improve. You can set the edamame aside for 1 hour for a deeper flavor to develop, or boil it right away. (4) Bring 1 quart of water to boiling and add the remaining salt. Add the edamame and boil for 3.5 to 5 minutes. When boiled for more than 5 minutes, the amino acids in the edamame begin to break down and escape, destroying the natural “umami” of the beans. After 3 minutes, we recommend removing a pod from the boiling water to check doneness. Edamame should be “al dente,” slightly soft but still firm and crunchy. 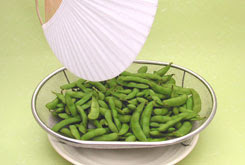 (5) Drain the edamame in a colander. (6) It is necessary to cool the edamame as quickly as possible, but using cold water will wash off the salty flavor and result in a watery taste. The Japanese spread the beans out on the counter or on a cooling rack and cool them with a small fan for a couple of minutes, and we’ve found this gets the best results. (7) Although amount of salt used in rubbing and boiling should be enough to adequately season the edamame, you can sprinkle more salt on top if you like a saltier taste. 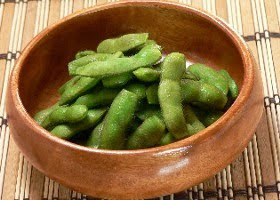 (8) Boiled edamame can be served warm or chilled. After boiling, it will keep in the refrigerator for three to four days.